The first thing you see when you open a GEDCOM file in GedScape is the main menu or welcome page. From here you can navigate to all other pages. You can customize the contents of the main menu in various ways, e.g. by adding custom reports. 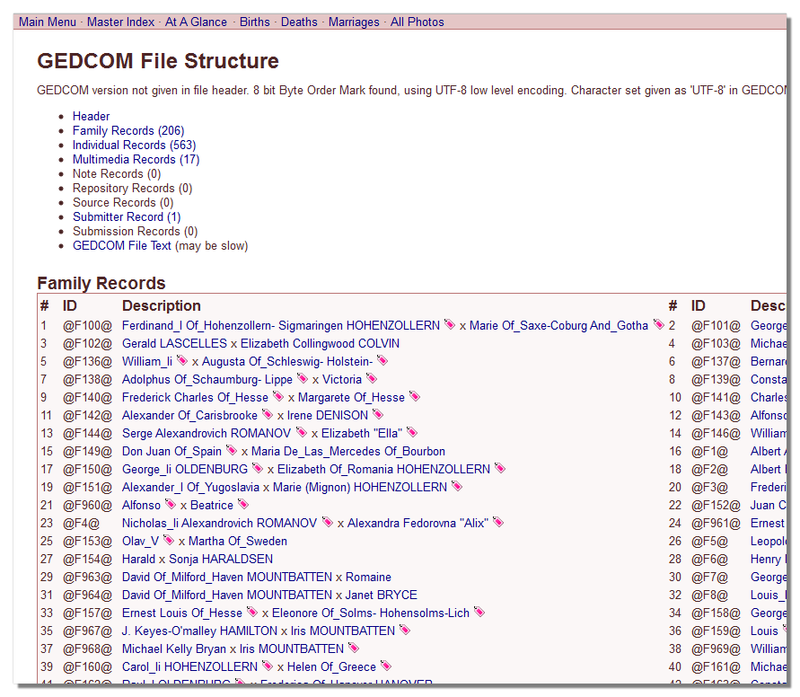 A key feature of GedScape is the ability to export data from the GEDCOM file. The Web site export feature lets you create a web site that looks almost identical to the GedScape display. 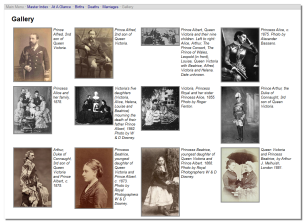 This is a very easy, powerful and quick way to create a web site for a collection of genealogical data. You simply customize the GedScape display so that the GEDCOM file is displayed exactly as you want it, then you do the export. Everything that you can display within the GedScape main window is exported, including pages such as custom reports and charts. You can also limit the exported data e.g. to exclude specific individuals from the web site. Tags can also be included in the generated web site. It is also possible to export an individual report as a standalone web page. There are no special requirements for the web server or browser client and the generated web pages are CSS/XHTML compliant. The Text file export feature lets you create a text/CSV file of data about individuals from the GEDCOM file. This is an easy way to transfer data from a GEDCOM into say a spreadsheet. You can control the text file format e.g. for line endings and character set. 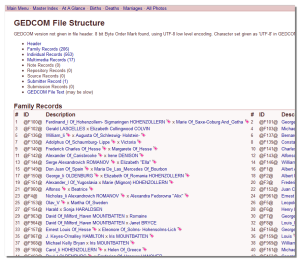 The GEDCOM export feature lets you save the data as a new GEDCOM file. A key use of this is to convert a GEDCOM file from one character set to another. E.g. you might use this to remove details of living individuals from a GEDCOM file prior to distributing it to others. There are various ways to customize the indexes e.g. 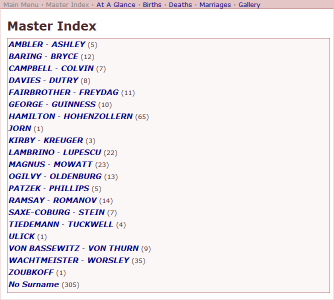 you can have single level indexes, multi-level indexes, indexes with first letter 'jump tables' and so on. The Details Page lets you view all data for a given record. Typically this is displayed whenever you click the link to an individual. 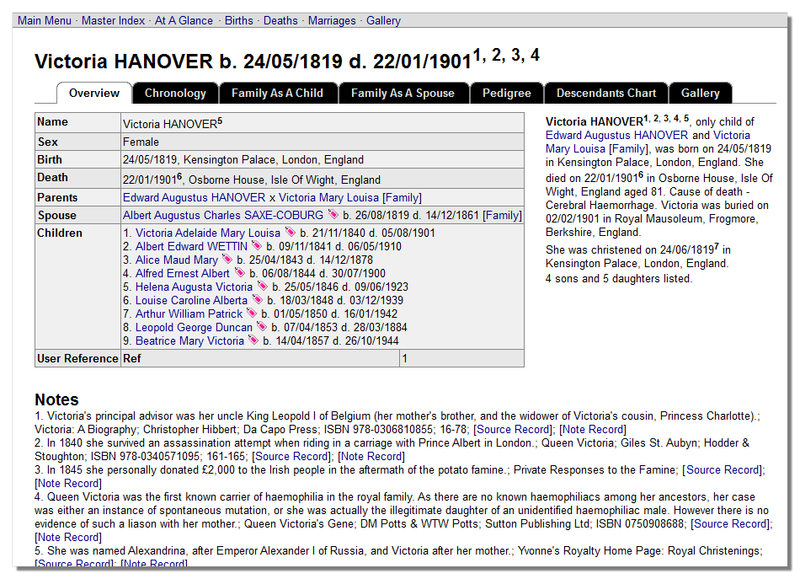 The page is divided into tabs which present the data in different ways. 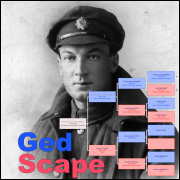 The first tab is always the 'Overview' tab which by default shows a table of key information about the person, a narrative description that is automatically constructed by GedScape from the events and attributes associated with the person, along with details of any children. Other tabs can display other useful information such as charts (see below), a table of events, notes, etc. You can control which tabs are visible along with many aspects of the contents of each tab. 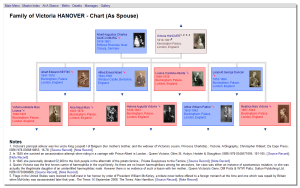 A family chart is a customizable graphic display of an individual family unit, with the parents above and children below. To see the family for an individuals birth family (i.e. their family as a child), click the Parents tab within the details page. For a person's spousal family (i.e. as parent), click the Family tab. 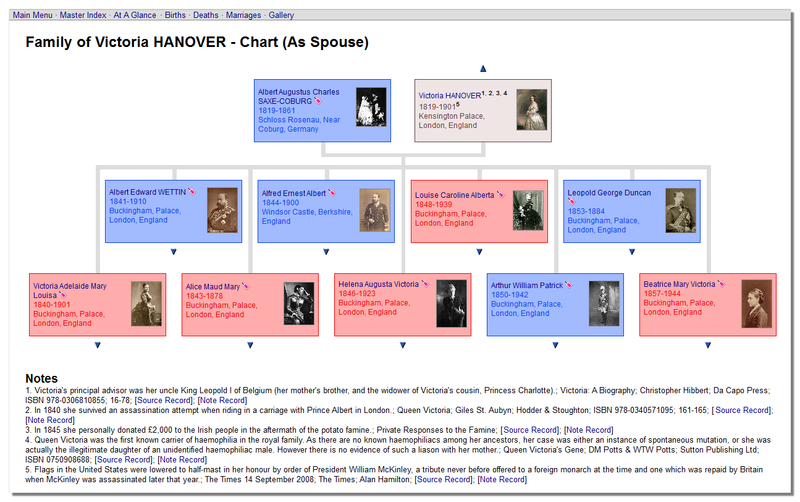 Where an individual has multiple spouses the chart contains buttons you can click to move between the families. 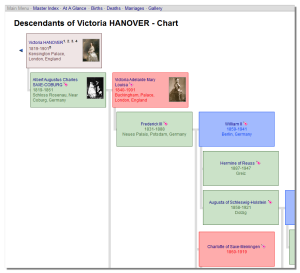 Family charts can be extensively customized - select Preferences from the File menu (Mac: use the 'GedScape' application menu), click on the Style tab and select Family Charts from the list. Descendants charts are customizable reverse pedigrees presented 'sideways on' with the starting individual/family in the upper left corner. These are available for both individual and family records. To customize the appearance of descendants charts select Preferences from the File menu (Mac: use the 'GedScape' application menu), click on the Style tab and select Descendant Charts from the list. 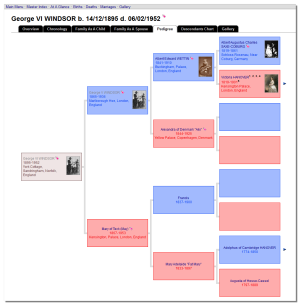 Pedigree charts are customizable 4 generation pedigrees with links to distant ancestors beyond, available for both individual and family records. 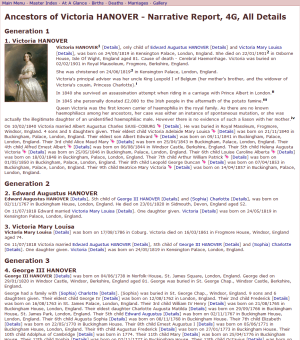 When there are distant ancestors available beyond the 4th generation these can be reached by clicking links shown to the right of the chart. 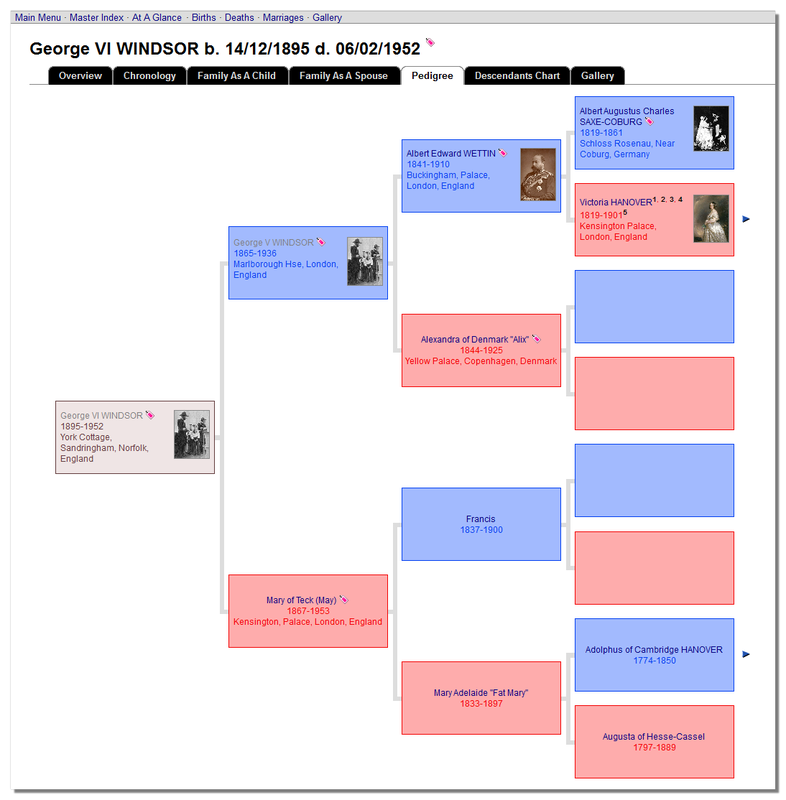 There are many configuration options available for pedigree charts, including the colors, text size and style, box sizes, detail of the information to be included and so on. To customize the pedigree charts, select Preferences from the File menu (Mac: use the 'GedScape' application menu), click on the Style tab and select Pedigree Charts from the list. All types of chart can be included in custom reports (see below). The gallery gathers together all GEDCOM multimedia images associated with the GED file and displays them as captioned, linked, thumbnails in a single page. This can also be included in web site exports (see below). A summary table is a table showing the key data for a group of individuals. 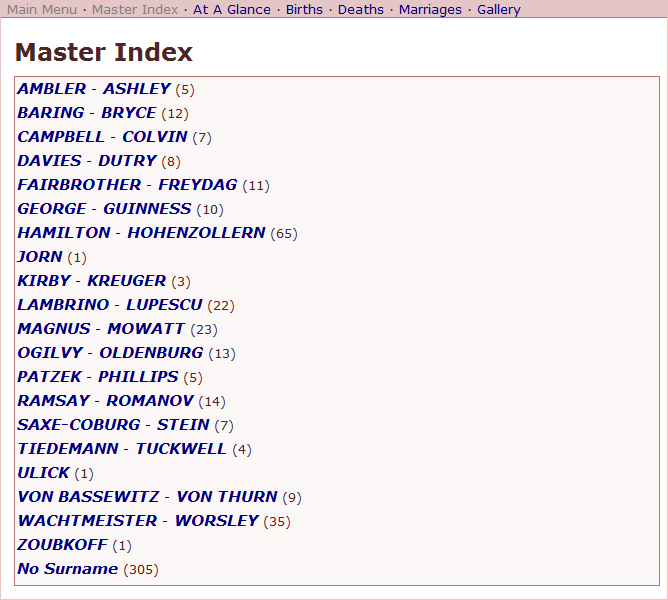 The tables are sortable on any of the text columns (such as last name, spouse name, etc). You can filter them so they only show tagged individuals (see below). Individuals listed are linked directly to the details pages. 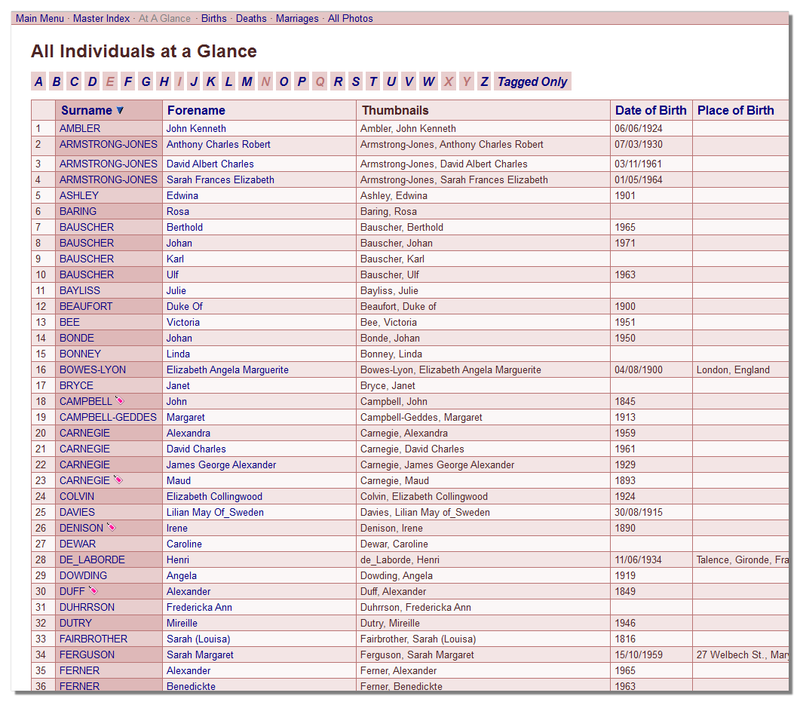 Browsing the summary tables is a quick alternative to using the indexes to find information in a GEDCOM. 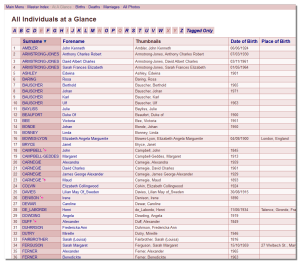 The main menu by default contains links to various summary tables, the main one containing all individuals within the GEDCOM (this is usually labeled All Individuals at a Glance). There are other tables listing all individuals with issue, all individuals with notes, etc. Within the summary tables you can then filter the display to only show the tagged records, and when you export data you can opt to restrict the export to tagged records only. 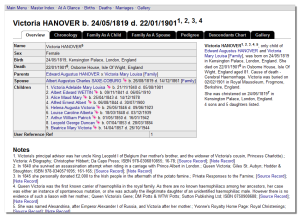 A report is a highly customizable collection of information about an individual and his/her ancestors or descendants, all gathered together in a single page. The ancestors/descendants may be numbered using standard genealogical numbering systems. Reports are available in a wide variety of formats and styles. They can be added to the main menu, and are saved between invocations of GedScape. Reports can be included as part of a web export (see below). You can also export a single report as an HTML file; such web exports can be standalone or they can link to separate pages that provide the full details of the individuals referenced from the report. Reports may include charts, photos and narrative text. You can also create reports that cover all individuals within a single GEDCOM. Similarly you can create a report containing all tagged individuals. GedScape can also be used to directly view the underlying GEDCOM data in a way that is more useful than simply viewing it with a text editor. From the main menu you can display an index of all records within the GEDCOM, including all the supporting record types such as notes, source records, and so on. The record details page for any record can also include tabs for viewing all the GEDCOM tags in that record, and separately can display the underlying GEDCOM text but in a hyperlinked form that links directly to other GEDCOM records with which it is associated. You can also view the entire GEDCOM text in a hyperlinked form so you can quickly move between linked records within the text.